Dione, one of Saturn's icy moons, has a weak exosphere which includes molecules of oxygen, according to new findings from the Cassini-Huygens mission. The international mission made the discovery using combined data from one of Cassini's instruments, called CAPS (Cassini Plasma Spectrometer), which includes a sensor designed and built at UCL's Mullard Space Science Laboratory. Dione joins Rhea and the main rings in Saturn's system in having an oxygen rich exosphere, as well as Jupiter's moons Ganymede, Europa and Callisto - the target for ESA's proposed JUICE (JUpiter ICy moons Explorer) mission for launch in 2022. Professor Andrew Coates (UCL Mullard Space Science Laboratory), one of the authors of the study said: "It now looks like oxygen production is a universal process wherever an icy moon is bathed in a strong trapped radiation and plasma environment. "Energetic particles hit the icy surface, the hydrogen is lost and molecular oxygen remains as an exosphere. We now know that this happens at Saturn's moons as well as Jupiter's - and it may well occur in extrasolar planetary systems too." It now looks like oxygen production is a universal process wherever an icy moon is bathed in a strong trapped radiation and plasma environment. Cassini flew by Dione on 7 April 2010. During that flyby, CAPS detected molecular oxygen ions near the moon's icy surface, due to bombardment by particles trapped in Saturn's strong magnetic field. The research is published online in the journal Geophysical Research Letters. A team of scientists, led by Robert Tokar at the Los Alamos National Laboratory in the US, used the measurements to estimate the density of the molecular oxygen ions to be in the range of 0.01 to 0.09 ions per cubic centimetre. These molecular oxygen ions are produced when neutral molecules are ionized; the measurements confirm that a neutral exosphere surrounds Dione. Electron measurements from UCL's electron spectrometer (ELS), part of CAPS, played a key role in reaching the conclusion of an exosphere, data from ELS showed the plasma wake due to Dione and characterized the changes in Saturn's magnetosphere during the flyby. 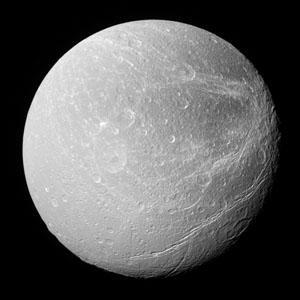 Dr Geraint Jones (UCL Mullard Space Science Laboratory), also an author of the paper, said: "Dione's exosphere is very thin - compared to Earth's atmosphere the density is about a million billionth. The exciting thing is that there is oxygen - and the oxygen may be being recycled via the surface." Image: A southerly view of Dione shows enormous canyons extending from mid-latitudes on the trailing hemisphere, at right, to the moon's south polar region. The image was taken in visible light with the Cassini spacecraft narrow-angle camera on Feb. 8, 2008.